M18CHIWF12-503X 18 volt Lithium-Ion cordless FUEL™ Impact Wrench, 1/2" receptor with friction ring. 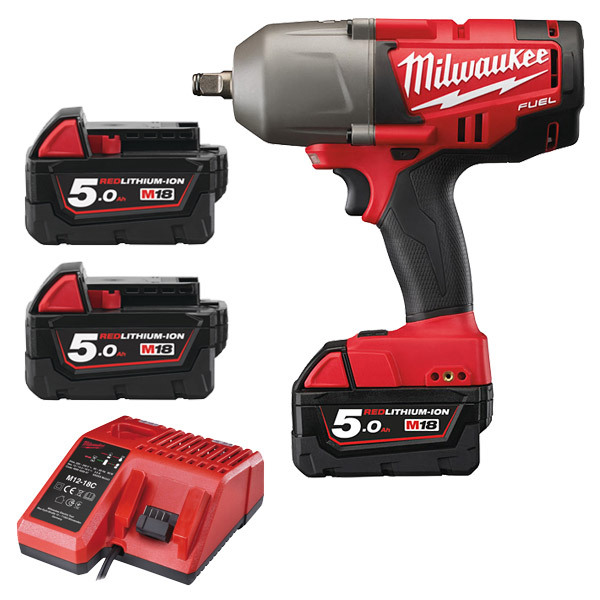 Milwaukee® designed mechanism optimized for high torque applications up to 950 Nm. Outperforms many other cordless, corded, and pneumatic impact tools, delivering up to 20% more torque. Milwaukee designed and built brushless POWERSTATE motor for longer motor life and up to 20% more power. The Milwaukee DRIVE CONTROL allows the user to shift Into two different speed and torque settings to maximize application versatility. RED LITHIUM-ION battery pack delivers up to 2x more run time, up to 20% more power, up to 2x more battery life and operates better down to -20°C than other lithium-ion technologies. All metal reversible belt clip - quickly and easily hang tool.